Experience The Trout Fishing Trip Of A Lifetime! Battle a Kenai River Lunker! Fish multiple days to increase your odds! "The Kenai River is Trophy Trout Heaven"
"Driftboat available by request only"
Alaska’s environment is very favorable to rainbow trout because of the vast number of salmon that swim through the state’s rivers every summer. Rainbow Trout fatten up on the flesh and eggs of spawning salmon. The Kenai River offers an abundance of rainbow trophies for those looking to experience the thrill of challenging this majestic, hard fighting fish. The Kenai River is one of the few rivers in the world with a thriving, healthy, native population of purely wild rainbow trout. Alaska Rainbow Trout fishing is one of the most exciting fishing experiences in the world. With a strong population of Rainbow Trout growing to monstrous sizes, anglers have much success catching their trophies on this fishing trip of a lifetime. "This is worldclass flyfishing for big rainbows on beautiful water. Jeremy is a fantastic guide who puts you on fish and really knows the rivers, techniques and Alaska’s fishery. Top notch!" “We had such an exceptional day of catching large rainbow trout on the Kenai River . We immediately caught fish with Nigel, and we also fished areas that other guides routinely passed up which worked out well, because the two largest fish we caught that day were in areas that others drifted by… we would recommend Driftaway to anyone who wants to land large rainbows on the Kenai River." Kenai river rainbow trout are the ticket to fast fishing action from mid August thru the beginning of October. A 32.5"x 17.5" rainbow trout. Caught on a late August Kenai River Guided Fly Fishing trip. 33 long x 21 girth=18.9 lb Kenai River Trophy Rainbow Trout. Guide Nick Ohlrich of Alaska Drift Away fishing with a 31 inch trophy Kenai river rainbow trout. 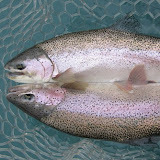 Here is a sweet profile of a 31 x 18.5 Kenai Rainbow Trout. This beast almost ripped the rod out of Cindy's hand. Caught fly fishing in August. Nick Ohlrich of Alaska Drift Away Fishing holding a clients 30 inch long by 20 inch girth Kenai rainbow trout. Guide Nigel Fox of Alaska Drift Away Fishing trips with a 32 inch middle Kenai rainbow. Guide Jeremy Anderson with a giant fall Kenai river rainbow trout. A huge native middle Kenai river rainbow trout. Sean Kelly's 32 x18.5 Kenai Rainbow took the bead hard. After some big runs Nigel Fox and Sean Kelly were able to put this fatty in the net. Nice fish Sean! Jerry Elmer with his big Kenai rainbow . This trout believe it or not was sight fished on a gravel bar just upstream of a slow drop off. This pig put up an epic battle. Jeremy Anderson with a early October middle Kenai rainbow trout. Guide Nigel Fox and Client with a chrome 32" long by 20" girth middle Kenai rainbow trout. Caught while Fly fishing in August. A happy guided Fly Fishing client with a trophy Kenai river rainbow trout. The Kenai River produces some of the largest rainbow trout in the state of Alaska. Especially in the months of August and September. A nice 30 inch rainbow trout caught on an August Fly Fishing trip. Guide Nick Ohlrich of holding a fat Kenai river rainbow trout that was caught during the September peak fishing season. Guide Nigel Fox and Ken Schmidt of Cooper landing, Alaska with a 29 inch long Kenai rainbow trout. Fly Fishing Guides show off one of the big Kenai River rainbow trout caught on a trip in September 2009. Nick Ohlrich of Alaska Drift Away Fishing with a chrome bright Middle Kenai river rainbow trout. Every year the Kenai River produces some of the largest rainbows in all of Alaska. Fish over thirty inches are largely unheard of in most waters but on the Kenai they are caught on a regular basis. Kids of Girdwood, Alaska at their finest... This kid shreds in the winter time and hook sets like a champion in the fall time. 11 years old.... landing a big Kenai river rainbow trout like he has been doing it for years. A middle Kenai river rainbow trout landed by Joe Elmer a client of Alaska Drift Away Guided Fishing. Cole Dunlap of Cooper Landing, Alaska and Nigel of Alaska Drift Away Guided Fly Fishing trips tearing it up on the Kenai. This chrome 30.5 inch long by 17 inch girth female rainbow hit hard and buckled Cole's rod over in an instant. Sweet fish Cole! Guide Nick Ohlrich with a 30 inch rainbow trout from a September guided Fly Fishing trip. Guide Jeremy Anderson holding another 30 plus inch, August Alaska rainbow trout. Guide Nigel Fox of Alaska Drift Away Fishing and John Elmer with a trophy Kenai rainbow trout. Guide Jeremy Anderson of Alaska Drift Away Fishing holding Jerry Elmer's 30 inch rainbow trout. A trophy Kenai river rainbow trout caught with guide Nigel Fox of Alaska Drift Away Fishing trips. Joe Elmer a client of Alaska Drift Away fishing with a late September Kenai river rainbow trout. Tracy with a nice chromer caught at the end of the day. What a great weekend of fishing & weather on the Kenai river. Guide Nick Ohlrich of Alaska Drift Away Fishing with a 30 inch rainbow trout caught in Rainbow Alley on the Kenai river. Guide Nigel Fox of Alaska Drift Away Fishing and Nikolai Wunderlin with his first fly caught Kenai rainbow trout. Drift Away fishing offer guided fly fishing trout trips on the Kenai river. Alaskan Website Design & Development by OTC.